When I visit a digital age classroom where students are actively using technology tools for inquiry and creating new products to show their learning, I see a similarity to an ecosystem. The students and teacher interact within the classroom environment in an organic way to construct learning experiences. 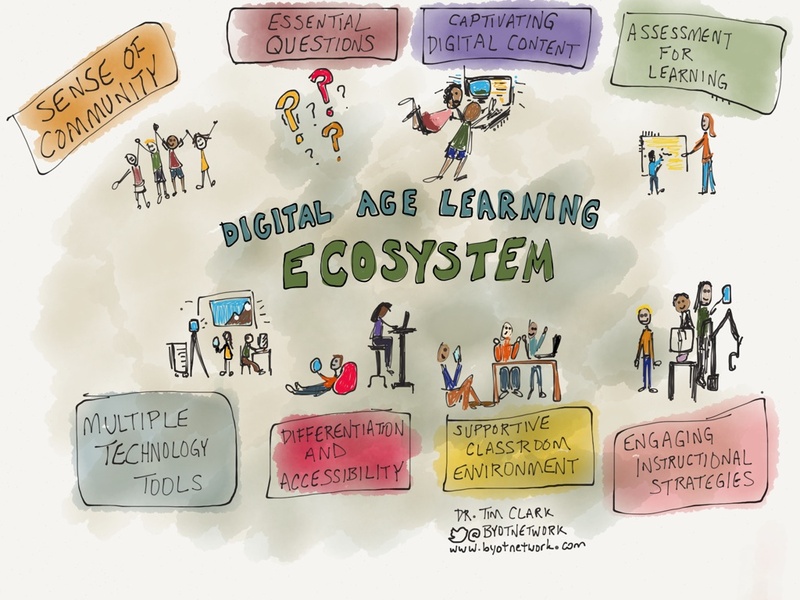 What are the components of this digital age learning ecosystem? What facilitates a sustainable learning environment that endures over time and through adversity? After reading my suggested attributes of a digital age learning ecosystem, post a reply with your own suggestions that I may have overlooked and should consider for future reflection. 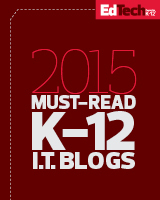 Teachers intentionally nurture a community in the digital age learning ecosystem. They know the interests, strengths, and challenges of their students, and they are eager to learn alongside them. Rather than viewing themselves as content experts with the primary purpose of directing instruction, teachers in the digital age learning ecosystem relish the roles of learner and explorer. Digital citizenship is ingrained throughout the practices of the classroom. Because students have typically developed their own norms and practices for how they should co-exist with technology, teachers in the digital age learning ecosystem must encourage appropriate netiquette and the responsible use of technology tools and resources. Teachers should design lessons or units of study within the digital age learning ecosystem by posing essential, open-ended questions. This strategy provokes deeper thinking and encourages students to develop additional questions for future exploration and possible solution. As teachers frame learning experiences around questions, they promote a stimulating culture of inquiry and innovation. Students need access to rich multimedia content, including primary resources and documents in a digital age learning ecosystem. Teachers can model strategies for conducting smart searches for the just right information needed to answer the essential questions of the lesson. That information can be further reviewed for accuracy, authenticity, and relevancy in order to develop the students’ skills with digital literacy. By utilizing a learning object repository, teachers and students can access resources as well as upload and share the content they create within their learning activities. Teaching rote information to prepare for standardized assessments has dominated classroom practice for the last several years, resulting in teacher-directed learning and high-stakes assignments, grading, and reporting. Conversely, the teacher in the digital age learning ecosystem employs assessment for learning. This practice utilizes more risk-free formative assessments where the teacher continually checks for student understanding so that students are able to freely share their developing ideas and skills. Teachers also use multiple forms of assessment in the process of learning so that students have more ways to experience success. These forms may include participation in discussion, student-produced content, and multimedia presentations. Whether students use their own technology tools that they bring to school in their pockets and backpacks or utilize school-provided technology resources, these devices develop new purposes within the digital age learning ecosystem. They are the means for building connections among teachers, students, and content. Different resources are also useful for different tasks. So, there may be a situation when a smartphone or a tablet is the appropriate tool for taking a photo, responding to a question, or accessing content, but other situations may require the use of a laptop or desktop computer, broadcast equipment, interactive whiteboard, or 3D printer. Learning when and how to use the right tool for a job are essential functions within the digital age learning ecosystem. Because each student is unique, teachers in the digital age learning ecosystem realize that there is no one-size-fits-all approach to learning. Students have different strengths and challenges, so their learning experiences should be tailored for those personal differences. Personalizing learning should include support for English language learners and students with academic and physical needs as well as remediation and enrichment opportunities for all students, as needed. Thoughtfully designed accessibility features within the classroom engage all of the learners by reducing factors that may limit success and impede equitable participation. The classroom environment of the digital age learning ecosystem includes both the physical and online areas that are used and curated by the teacher and students. There are a variety of learning spaces and tools available as needed for the students to use for different learning activities, including nooks for individual innovation and quiet reflection in addition to zones for collaborative work and discussion. The learning environment is vibrant, and furniture and equipment are mobile so that they can be easily rearranged to adjust for multiple learning situations and functions. Teachers plan instructional strategies that engage students within the digital age learning ecosystem. With a focus on the skills of communication, collaboration, creativity, and critical thinking, the processes involved in learning, rather than just the products, gain new importance. Not only does this focus ensure that students have multiple ways to show evidence of success in the classroom, it also helps them develop the skills necessary for success in their future careers. Digital age teachers consider how they implement these strategies throughout each day and realize that they can facilitate student learning without everyone doing the same thing, at the same time, and in the same way. Although I described each of the above components of the digital age learning ecosystem separately, they are all integrated parts. With continued support, this learning environment begins to take on a life of its own as the teacher and students feel a sense of ownership and pride over its sustainable success. “ecosystem.” Dictionary.com Unabridged. Random House, Inc. 06 Jul. 2014. <Dictionary.com http://dictionary.reference.com/browse/ecosystem>.